Alcohol Breath Analyzeris the most common method of testing for blood-alcohol content in use today. Ultramind breath analyzers estimate the concentration of alcohol in the body by measuring the amount of alcohol exhauled from the lungs. The hand held analyzers have digital display, these are easy to use and provide accurate readings. The device can also be connected to the computer for logging data and a compact sized printer to print out the details of alcohol concentration, date and time. Now a days, Alcohol Breath analyzersare widely used by Traffic Police,Industries,Railways, Airports & Airlines, Military, Factories & Offices, Hotels & Restaurants, BPOs, MNC’s,Security companies, Bus & Taxi operators, Educational institutions, laboratory, Personal etc. We offer a wide range of alcohol breath analyzers as per your requirements. 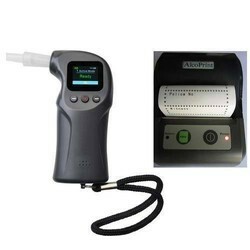 Product Description: Alcohol breath PT200P is a Professional Fuel Cell Alcohol Tester for Road side Screening Device. Using the electrochemical reaction for platinum Vs ethanol molecules, gives the most stable and reliable measuring technology. Flow detect automatically 200 Record Memories. 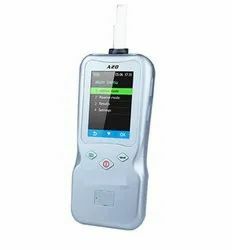 Alcotest Breath Tester used as a monitor, It can indicate when equivalent blood alcohol percentages are below or above the legal limits. Power Supply: Interchangeable rechargeable battery. Passive test:Quick test within1 sec. Storage environment:-20 Degree C to 75 Degree C.
Measurement Accuracy: /–0.03 mg/L at alert pointDrift: typically < 1.0 % of the measurement value/month. Optional packing/accessory :Metal case, mouthpiece,rechargeable battery. Advantage: is a Professional Fuel Cell Alcohol Tester for Road side Screening Device. Using the electrochemical reaction for platinum Vs ethanol molecules, gives the most stable and reliable measuring technology. Note :All Debit/Credit Card accept here for your handsome purchasing. 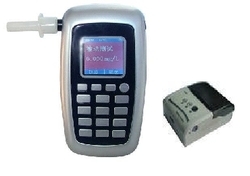 Product Description: Breath Alcohol Analyzer offers professional users precise and quick breath alcohol analysis in a user-friendly and compact form. Thanks to its wide range of possible configurations, the hand-held instrument can be easily adapted to meet different measurement results can be obtained within a very short period of time. international regulations and guidelines. Instrument preliminarily to determine a subject's breathe alcohol level quickly and precisely. Measurement time < 10 seconds. 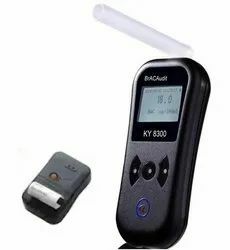 Product Description :Alcohol Breath Anlyser, KT8300P With fuel cell based and designed for professional use, KT- 8300 is a handheld Instrument preliminarily to determine a subject's breathe alcohol level quickly and precisely. 1. Quick and Precise Analysis: 32-bit embedded processor secures high performance of the system. 2. UK made Electrochemical/Fuel cell Sensor: Highly specificity to alcohol, unaffected by other possible breath contaminants. 3. Data Handling Ability: Compact gas circuit design and advanced analysis process assure fast, accurate and stable testing performance. 4. Active and Passive Blow Methods: Both methods can be applied to provide convenience to the user. 5. Power Supply: Built-in Li-ion battery realises reliable and long-time testing action. 6. Memory Capacity: Data storage of 5000 test results. Any test results can be downloaded to the computer for data backup. 7 After Sales Service: Independent intellectual property rights integrated with research, development and production ability guarantee strong after-sales service. Product Description: Ultramind AT 8800P is a hand held, portable breath alcohol tester to check subject’s breath Alcohol concentration with reliable accuracy. 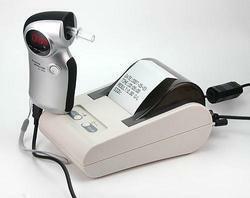 This device can be connected with computer to logging data and a compact sized printer to print out the alcohol concentration, date and time. It has facility to record 5000 memory, portable and modern design, real time clock display support,optional mini printer to keep testing results. It can be used at station, office,company, home and factory, by trafic police, military,laboratory etc. Product Description :AT8100 is a hand held, portable breath alcohol tester to check subject’s breath Alcohol concentration with reliable accuracy. This device can be connected with computer to logging data and a compact sized printer to print out the alcohol concentration, date and time. and a compact sized printer to print out the alcohol concentration, date and time. company, home, and factory, by traffic police, military, laboratory. etc. 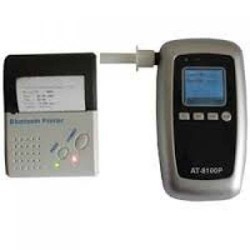 Alcoscan AL6000P is a device that measures alcohol content in the human breath and displays the results as blood alcohol concentration (BAC) and also it can print out the reading immediately. * One can type Driver Name, License No & Police Name.... etc. 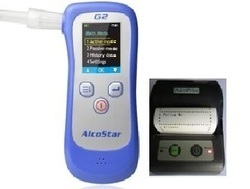 We are leading provider of AlcoPatrol Breath Alcohol Analyzer with Printer to our client. 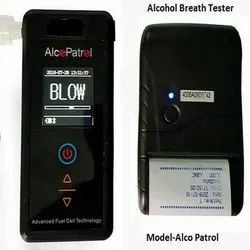 Product Specifications: AlcoPatrol, Breath analyzer is fuel cell-based and designed for professional use, It is a handheld Instrument preliminarily to determine a subject's breath alcohol level quickly and precisely. Quick and Precise Analysis: 32-bit embedded processor secures high performance of the system. The UK made Electrochemical/Fuel cell Sensor: Highly specificity to alcohol, unaffected by other possible breath contaminants. Data Handling Ability: Compact gas circuit design and advanced analysis process assure fast, accurate and stable testing performance. Power Supply: Built-in Li-ion battery reliable and long-time testing action.Memory Capacity: Data storage of 2000 test results. Any test results can be downloaded to PC.